Michael Joseph Porcaro (May 29, 1955 – March 15, 2015) was an American bass player known for his work with Toto. He retired from touring in 2007 as a result of being diagnosed with amyotrophic lateral sclerosis (ALS). He was the middle brother of Toto members Jeff Porcaro and Steve Porcaro. Their father is jazz drummer-percussionist Joe Porcaro. Mike Porcaro is the second of the three Porcaro brothers. The three brothers were taught drums by their father at his drum shop every weekend. Jeff said that he himself wasn't the best drummer, adding that Mike was a better player than him before he switched to bass, while Steve later took up piano before they moved to California. Jeff explained that when the brothers took guitar lessons, Mike took off at the instrument while Jeff gave up after three lessons, and since the family had only one drum kit and one bass, Mike was assigned the bass. 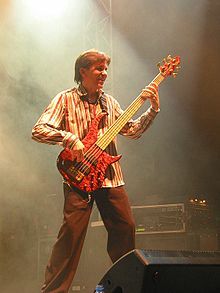 Porcaro worked as a session bass player before replacing Toto original bass player David Hungate in 1982 shortly after the band completed recording the Toto IV album. Porcaro played cello on a track for the album and subsequently appeared in the band's videos and performed as a full band member on the world tour in support of the album. He remained with the band until 2007. Along with Toto, Porcaro played numerous sessions in Los Angeles, and toured with Michael Franks on his first tour. He then toured with Seals and Crofts, Larry Carlton, and Boz Scaggs. He appears in the video for the song "JoJo" by Scaggs. In Flames bass player Peter Iwers said that his bass playing style was influenced by Porcaro. Porcaro stopped performing with Toto in 2007 after experiencing a growing weakness in his fingers that was making it increasingly difficult for him to play. He was replaced by Leland Sklar for the remainder of the tour and Toto disbanded in 2008. In February 2010, it was announced via official press release that Mike Porcaro was suffering from amyotrophic lateral sclerosis (ALS)–a terminal illness that causes the degeneration and death of the motor neurons that control the voluntary muscles of the body–and that former band members of Toto, including Steve Porcaro, would reform and do a short tour through Europe in support of him in the summer of 2010. The regrouped Toto continued to tour and perform for Mike's benefit during 2011. In September 2012, it was reported in Classic Rock magazine that he was doing as well as could be expected with his disease, but he was in a wheelchair as the disease was progressing. Porcaro died at his Los Angeles home on March 15, 2015, at the age of 59, from complications of ALS. He was buried at Forest Lawn Memorial Park in the Hollywood Hills of Los Angeles. ^ "Toto History". Toto. Retrieved 2013-11-11. ^ Hot Rocks: The Toto Story (LP). United Stations Programming Network. May 6, 1988. Event occurs at 35:00. ^ "IN FLAMES | Interviews | Rockdetector". Web.archive.org. Archived from the original on September 30, 2007. Retrieved 2015-03-15. ^ "Official TOTO Website - Leland Sklar". Toto99.com. 1947-05-28. Retrieved 2011-07-20. ^ "Official TOTO Website - Hot News". Web.archive.org. Archived from the original on July 22, 2010. Retrieved 2015-03-15. ^ "Official TOTO Website - Leland Sklar". Toto99.com. 1955-12-08. Retrieved 2011-07-20. ^ Kielty, Martin (September 13, 2012). "Toto's Mike Porcaro 'hanging in there'". Classic Rock. ISSN 1464-7834. ^ "Mike Porcaro, Bass Player for Toto, Dies at 59". The New York Times. Associated Press. 16 March 2015. p. A24. ^ "Mike Porcaro: the groove master". Accordo. 21 March 2015. Retrieved 2018-09-15. This page is based on the Wikipedia article Mike Porcaro; it is used under the Creative Commons Attribution-ShareAlike 3.0 Unported License (CC-BY-SA). You may redistribute it, verbatim or modified, providing that you comply with the terms of the CC-BY-SA.